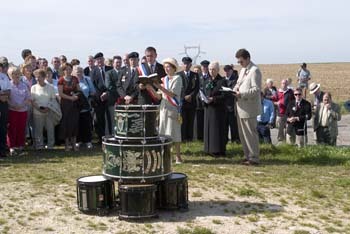 On the battlefield serving soldiers created their church alter using the drums from the military band. 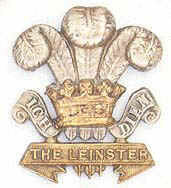 Here the Association recreate the tradition using the drums of the London Irish Band. During the ceremony the mayoress of Ginchy stressed that it was important for the youth of France to never forget the devastation of war and to honour those who had fought to relieve their homes in 1916. Standard bearers of the representative regiments of the Combined Irish Association present their colours. Moments of reflection during the two-minute silence to commemorate the fallen. This special commemoration was built by the farming population of Ginchy to commemorate the location of Ginchy Telegraph. On this giant clover leaf would be placed the wreaths of remembrance.